Out of 11475 people who joined the Malaysian space program, Sheikh Muszaphar Shukor was selected to be the first Malaysian astronaut and beam up to space in 2007. He rose above thousands of able competitors. What does he has that others lack, was it sheer luck, hard work or just destiny? Whatever it is Sheikh Muszaphar propelled to fame as soon as he landed back on earth. Hunted by the media and anybody who wanted to gain leverage from his fame, magazines of whatever genre line up to get him on their covers. The fascination of Malaysian is intriguing as is his own success. Even the first Muslim astronaut Prince Sultan Bin Salman, a nephew of King Abdullah of Saudi Arabia commented that Sheikh Muszaphar “is the pride of the entire Islamic world”. Perhaps he is the first Muslim who went to space without being apologetic of his faith. He maybe the ninth Muslim who went to space but he is the first Muslim astronaut who observed fasting during Ramadhan in space and was supplied with a formal guideline, a book entitled A Guideline of Performing Ibadah (worship) at the International Space Station (ISS)” which was approved by Malaysia’s National Fatwa Council. “I want to share with the world what Islam is all about, when I went to space I do not want to focus only on science I wanted to involve Islam and arts. I want to show particularly to the Islamic world that no matter where you are you have to do your prayers, no one knows how it is done, I want it to be a reference for future Muslims going to space” said Muszaphar. Meeting with Sheikh Muszaphar will clear any doubts as to whether he deserves all the attention. The man exudes confidence and you can feel the atmosphere of the room change as soon as he walks in. “I remember when looking up to the sky imagining fantasizing and things like that. 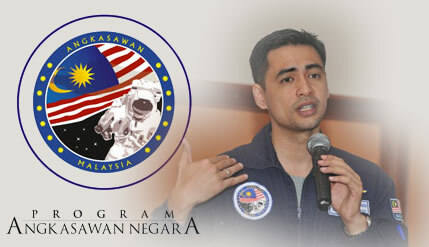 I knew I wanted to be an astronaout since I was ten, I always knew that one they I would go,” said Muszaphar. This is what sets him apart from the rest, instead of just wishing to go to space, he knew without a doubt that he would go to space one day. Everyone has dream but they tend to cut their dreams into smaller pieces when faced with the rough and tumble of life. In the end they settle for less than what they bargained for. They imprisoned their minds with limitations as to what is achievable. He keeps stressing that it is important to hold on to your dreams and to let it manifest into reality. “That’s why you got to believe in yourself, most people dream but what do they do about it? Do they work hard for it? As time goes by it just subsides and goes away. So you must hold on to your dreams knowing that you will do it. So keep your dreams alive and keep doing things that might lead you closer to your goals and when the opportunity arises just grab it,” Sheikh said Muszaphar. So how do you have this unwavering faith in your dreams when if you think logically there is no possible way that you will come close to your dreams? The trick according to Sheikh Muszaphar is you must develop the mental strength to see beyond present circumstances. Muszaphar explained how to have this mental strength and not let your present circumstances prevent you from aspiring for what may seem impossible right now. “If you want something in life you must dream big. You must try very hard to achieve your dreams. You may not know and you may not get it in five years. It took me 25 years to achieve my dream. It can be a lifelong quest to make your dream a reality. So keep your dreams alive and keep doing things that might lead you to closer to your goals,” said Muzaphar. Mental strength, however, is not something you acquire overnight; it is persistent mental control. It does help if you have a good upbringing and live in a supportive environment. “Mental strength has to be built at an early age, you got to read lots of self-help and motivational books, you got to be surrounded by positive people and you must not have any negative aura around you. Things like that. When you come to a stage when you are so sure of yourself you will succeed” said Muszaphar. Yet the lack of an ideal upbringing is not an excuse to settle for a mediocre life. A good upbringing does help but it is not a prerequisite for success. It is really about training your brain on how to response to your circumstances. It is about perception and seeing the glass half full instead of half empty. “I am fortunate and blessed to have a good upbringing. Yet coming from a disadvantage background is not an excuse to not succeed in fulfilling your dream. Look at Einstein he never passed his high school exam. It is more of how you think and your being perspective to the circumstances that happen to you. It’s not exposure but it is your mindset” said Muszaphar. Sheikhs Muzaphar do admit that it is difficult for some people to hold on to their dreams when all they can think about is making ends meet, mouths to feed and bills to pay. So he outlined a simple technique that will help build the mental strength that would allow you to hold on to your dreams no matter what. Sheikh Muszaphar urged anyone who wants to achieve something to visualize the goals they have already achieved. Visualisation is a technique used by Russian Scientists who studied groups of Olympic athletes. They compare the performance of athletes who spend 75 percent of their time on physical training against those who trained mentally. The findings were the group that train mentally performed better. “It is the power of visualization, every night before I go to sleep I will always talk to my mind and visualize that I am going to space one day, I am going to space one day. You may not get it now and you may not get it 5 years from now. It took me 25 years to achieve my dream” said Muszaphar.
. His goal right now is to change the mindset of five children a day. Muzaphar wants children to dream big and believe that whatever their mind can conceive they can achieve. Sheikh Muszaphar have gone to space, but his feet is firmly nailed to the ground, though he revealed what his secret of being an astronaut is but the biggest secret of his success is probably in what he said at the end of the interview. “I believe in destiny and I believe in fate, if God says you are the one you will be the chosen one nothing can stop you from getting what is in store for you from the Almighty, luck does play an important role but I believe that we create our own luck”.